In this book published by Christmas Press Picture Books, I retell two traditional Chinese fables – The Magic Fishbones which is an early Cinderella story. It first appeared in Miscellaneous Morsels from Youyang by Duan Chengshi around 860 and this may be the only time the story has been directly translated into English from the original. The other story is The Weaver Girl and the Cowherd. It is one of the four great fables of China. It is a love story celebrated on the 7th day of the 7th month on the Chinese calendar called the Qixi Festival when lovers look up to the heavens. The illustrations are by David Allan. They are beautiful and delicate and remind me of woodblock prints. The book is dedicated to my mum, who used to tell me Chinese fables when I was too young to read. “In the final installment of the Two Enchanted Tales series, ancient Chinese folklore is the focus. Readers are treated to two magical tales — The Weaver Girl and the Cowherd and The Magic Fishbones — that tell stories of young love and a girl who becomes the belle of the ball. In gorgeous retellings, complemented by elegant illustrations, Two Enchanted Tales from Old China is another Christmas Press book to treasure. “There are two delightful tales in this picture book. The first tale, The Weaver Girl and the Cow Herd, is about two stars in the heavens that fall in love. Zhinu, the weaver girl, is the granddaughter of the Heavenly Empress, and she separates the two lovers. Niulng is banished to the land of mortals where he is reborn into a farming family and has no memory of the past but feels a connection with the stars. His loyal Ox is no ordinary Ox, and Niulang is guided by his wisdom in search of a bride. 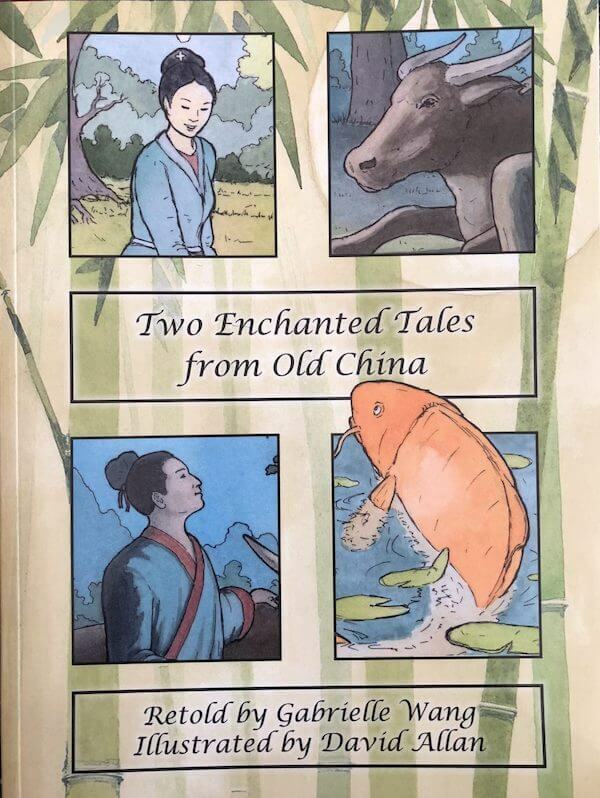 The second tale, The Magic Fish Bones is about a time in the ancient country of Chin, where Ye Xian was left to slave for her stepmother and stepsister after her father dies. Though you could put this story alongside Cinderella; this story stands on its own two feet and has a totally different ending. Ye Xian has a fish with golden scales which she loves and tends too. After a while, the fish grows too big, and she releases it into a nearby pond. Each day she calls the fish to the edge of the pond and gives it treats. Her horrid stepmother kills the fish, but the bones are magic.